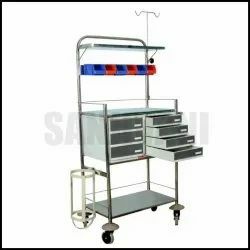 Pioneers in the industry, we offer laparoscopic trolley, double pillar mayos hospital trolley, full stainless steel bed side table, instrument trolley, powder coated emergency drug trolley and single pillar hospital trolley from India. Counted amongst the leading entities of this domain, we are betrothed in offering Laparoscopic Trolley. 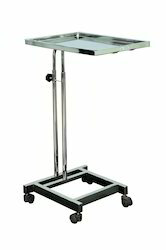 Since our foundation, we are engaged in presenting an outstanding quality array of Mayos Hospital Trolley Double Pillar. The trolley is equipped with 770 mm L x 510 mm W dimension. The trolley has the height adjustment from 845 mm to 1300 mm. Besides, clients can get the trolley from us at reasonable rates. With an aim to fulfill varied requirements of our valued clients, we are engaged in offering Bed Side Table Full Stainless Steel. The offered bed has 50 mm x 25 mm CRCA tubular framework with two section perforated CRCA sheet on the top. Furthermore, the bed provides backrest operated by screw and lever mechanism with attached using stainless steel folding handles. Besides, clients can get the bed from us at reasonable rates. 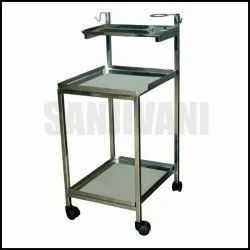 We are an acclaimed name in the market, engaged in presenting a superior quality array of Instrument Trolley. 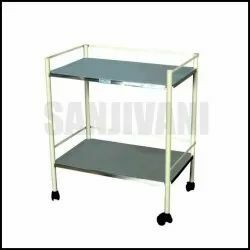 The offered trolley is developed in accordance with industry norms and quality parameters. In the offered trolley, our professionals use the approved material during the manufacturing process. In addition, this trolley can be built and developed according to the specification provided by the clients. Pioneer in the industry, we are engaged in presenting an impeccable range of Emergency Drug Trolley Powder Coated. At our unit, our professionals manufacture the trolley by adhering to industry norms. They also make sure to use quality materials and approved components for manufacturing the trolley. Once the trolley is ready for operation, our engineers ensure by opting strict quality checks. 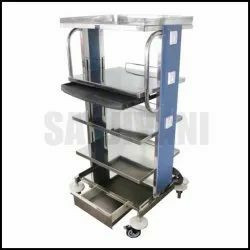 Assisted by a qualified workforce and advanced manufacturing unit, we are engaged in offering a wide range of Hospital Trolley Single Pillar. This trolley is mounted on 50 mm Dia. Castors. 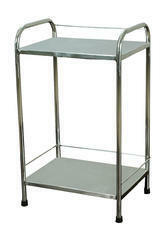 In addition, the trolley is manufactured using stainless steel/powder coated frame with stainless steel tray. Besides, clients can get the trolley from us at reasonable rates. To meet the diversified requirements of our prestigious clients, we are engaged in offering Ecg Machine Trolley. This efficient trolley is manufactured using quality materials and advanced technology. Our professionals manufacture all kinds of the trolley according to the trending demands and clients’ needs. In addition, the offered trolley is built and developed adhering to industry standards. Fostered with vast industry experience and knowledge of this domain, we are engaged in presenting Crash Cart. The cart is manufactured using stainless steel and powder coated frame with S.S. top. Furthermore, the cart system mounted on 100mm Dia. Wheels with diagonal breaks. Also, the cart is developed using stainless steel I.V. rod and cardiac massage board. Besides, the cart can be purchased from us at cost effective rates. 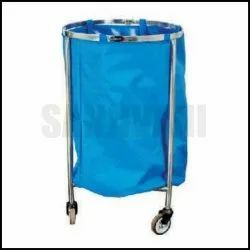 With an aim to fulfill varied requirements of our valued clients, we are engaged in offering Linen Trolley. 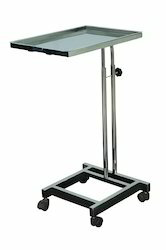 The offered trolley has 50 mm x 25 mm CRCA tubular framework with two section perforated CRCA sheet on the top. Furthermore, the trolley provides backrest operated by screw and lever mechanism with attached using stainless steel folding handles. Besides, clients can get the trolley from us at reasonable rates.